Sebaceous Adenitis - Decisions, Responsibilities & Realities. Lelly (born 21 Jan 1995) was diagnosed with bilateral polar cataracts at 18 months. The cataracts were inactive, probably occurring at 7 months or so, not developing and not affecting Lelly's sight. There has been no further development with the cataracts as far as we know. Both Lelly's parents, and those of her siblings who have been checked have been tested repeatedly clear. At that stage we took the decision that the only responsible thing would be to neuter both Lelly and her mother, Anna. 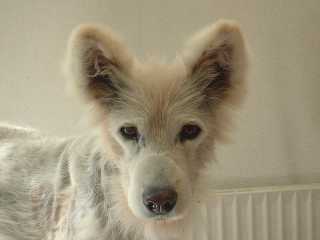 At about 2 years we noticed Lelly was not holding undercoat. She gradually degenerated, her coat thinning & becoming brittle and greasy. Lelly was borderline for every test done, so we tried what we thought might help. She was treated for borderline under active thyroid with daily thyroxin. She was treated with immunotherapy for her borderline allergies to dust mites and food storage mites. Nothing changed. In 2001 we at last found out what was wrong with Lelly - Sebaceous Adenitis. Sebaceous Adenitis is an autoimmune condition and at that time, felt to be untreatable. Basically, her own immune system had turned against the sebaceous glands in her skin. Skin function is severely compromised, unable to support hair growth or to resist normal skin bacteria that the other dogs deal with every day. I carried on bathing her weekly, trying to control her symptoms. We did find that antibiotics helped the bacterial break outs on her skin and lips, but had a "healthy" stinking, bald, greasy dog. In every other respect she was completely normal. In November 2003 my vet informed me of a new treatment that would be coming available, Cyclosporin. It is an immunosuppressor used in transplant surgery, but the side effects are unpredictable and include severe kidney damage. I trawled the internet and found, amongst others, some wonderful American Akita sites where they talked about Sebaceous Adenitis and its treatment. I concluded that the risks were too great to put a 9 year old Sami girl through for what is after all only a cosmetic condition. However, there was much talk of the benefits of drenching affected animals in oils before bathing. I tried baby oil, left it on for an hour, then bathed her. It lifted all the dry, black skin away. Lelly came out pink, the first time we'd seen pink skin on her in years. I repeated the baby oil and bathing next week. Within 2 weeks there was a fine film of hair. 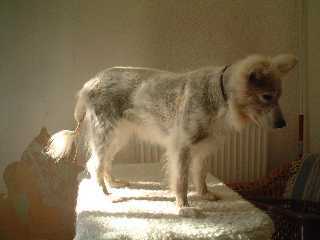 Here we are in February 2004 and Lelly is covered in curly soft undercoat. She doesn't smell, she isn't greasy; she is a pleasure to be with. 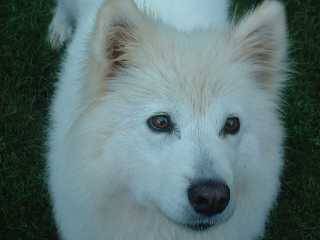 She looks like a lamb; she doesn't look like a Samoyed. Lelly is no longer vaccinated; both my other Sami girls are fully vaccinated. I do believe in the advantages of modern vaccination, but Lelly's immune system is compromised and after discussions with my vet I felt this was the right path to take. I don't know how the development of her cataracts is linked to her autoimmune disease, but I am sure that there is a link. Lelly is massaged weekly in baby oil, followed by bathing in Groomers, Vet Grade, Evening Primrose Oil shampoo. 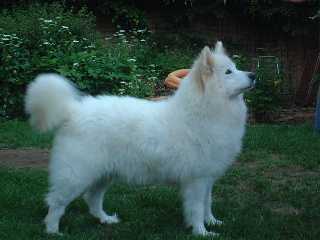 It is hard to explain the despair I've felt at times, to see a beautiful Samoyed degenerate into something unrecognisable. I've never given up on her, though living with Lelly has not always brought me joy, but she's my responsibility. She didn't ask to be born . She didn't ask to develop this degrading condition. Lelly remains an enigma: she is a statistical blip! I am so proud of Lelly; she has retained her Sami smile and zest for life through all of this. She is zany, eccentric, mad as a hat.